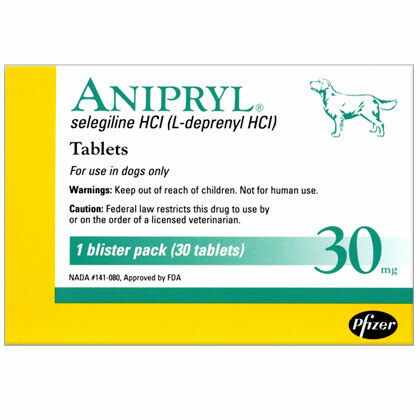 Anipryl (selegiline), also known as L-Deprenyl, is a monoamine oxidase inhibitor (MAOI) that treats Cushing's Disease and Canine Cognitive Dysfunction Syndrome (senility). Anipryl increases the concentration of a nervous system messenger chemical called dopamine. Higher levels of dopamine improve many cognitive processes. Treating Cushing's Disease has traditionally been centered on suppressing the adrenal gland’s production and release of cortisone. However, this approach has a high potential for side effects. Selegiline has allowed for a new approach by suppressing the pituitary gland directly. Possible Side Effects: May see loss of appetite, drooling, vomiting, diarrhea, lethargy, anemia (pale gums), disorientation, restlessness, repetitive behaviors, loss of hearing, itching, and shaking. Contact your veterinarian if your pet experiences any of these signs. If your pet experiences an allergic reaction to the medication, signs may include facial swelling, hives, scratching, sudden onset of diarrhea, vomiting, shock, seizures, pale gums, cold limbs, or coma. If you observe any of these signs, contact your veterinarian immediately. Precautions: Not for use in animals who are hypersensitive (allergic) to it. Your veterinarian will need to perform laboratory tests to determine which type of Cushing's disease your dog has. Selegiline is not for use in dogs who have Cushing's disease caused by adrenal gland tumors or from administration of corticosteroids. Do not use in breeding, pregnant, or lactating animals (female dogs nursing puppies); the safety of the drug has not been determined in these animals. Do not use this medication for the treatment of aggression. Drug and Food Interactions: Notify your veterinarian of any other medications, including vitamins and supplements, your pet is taking while your pet is receiving selegiline. Do not use within 5 weeks of antidepressants such as amitriptyline, or selective serotonin reuptake inhibitors (SSRIs) such as Prozac. Do not use with meperidine or other narcotics. Do not use with phenylpropanolamine (Proin, Propalin, Cystolamine). Do not use with ephedrine or within 2- 5 weeks of using other monoamine oxidase inhibitors (MAOIs) such as amitraz (an ingredient in some tick collars, and in Mitaban, a treatment for mange). Consult your veterinarian before using other medications or tick collars along with selegiline. Do not give your pet aged cheese. In combination with selegiline it can cause severe high blood pressure or death. Signs of Toxicity/Overdose: May see drooling, slow pupillary response (pupils do not get smaller in bright light), panting, dehydration, or change in behavior. Signs of overdose may not appear for 12-24 hours. An overdose is very serious; death may occur. Contact your veterinarian immediately if you see any of these signs. Keep this and all other medications out of the reach of children and pets. ** This information may not cover all possible uses, directions, side effects, precautions, allergic reactions, drug interactions, or withdrawal times. Always consult your own veterinarian for specific advice concerning the treatment of your pet.